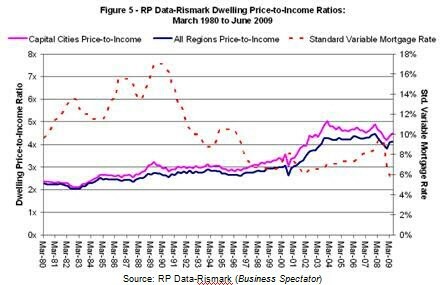 The inflation of Australia’s housing bubble was confirmed recently as data released revealed that for the first 11 months of 2009, property prices in Melbourne sky-rocketed by 17%, closely followed by Darwin (15%), Hobart (14%) and Sydney (12%). 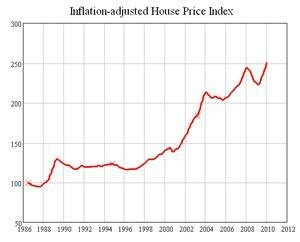 During that period, inflation (which over the past century has been the primary determinate of house price growth) was 1.3%. The real estate industry was as usual on hand to encourage the boom. Real Estate Industry of Victoria boss Enzo Raimondo told The Age that "if your budget is around the median and you want to live close to the city, the best option is a smaller place, unit or apartment as they allow you to build your equity and put yourself in a better position to buy the home of your dreams in a few years".